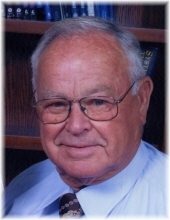 Willie L. Anderson, 90, of Lexington, IL passed away at 3:15 a.m. Friday, February 1, 2019 at Advocate BroMenn Medical Center, Normal. Funeral Services will be 10:30 a.m. Tuesday, February 5, 2019 at the Lexington Community Center 207 W. Main St. with Rev. Bill Brown officiating. Burial will follow at Lexington Cemetery. Visitation will be 4 to 7 p.m. Monday at the Community Center and one hour prior to the service on Tuesday. Memorials may be made to the Lexington Community Church or the Route 66 Hall of fame Museum. Calvert-Johnson & Musselman Memorial Home, Lexington is assisting the family with services. He was born in Chenoa, IL to William D. and Bessie Coyle Anderson on April 17, 1928.He married Edna Marie Brown in St. Louis, Missouri on September 8, 1945. She survives. Also surviving are three sons, Ronald (Donna Terven) of Lexington; Randy (Ann), and Rick (Diane) both of Clinton, IL. He has seven grandchildren and 9 great-grandchildren and numerous nieces and nephews. Also surviving are three brothers, Bob Anderson of Gibson City, and David and Edward Anderson, both of Towanda; and two sisters, Bernice Climpson and Sharon Sleeter. He had owned and operated Willie Anderson Trucking in Lexington since 1947. His whole life was dedicated to trucking. His trucking business was an original carrier on the historic roadway. He was inducted into the Route 66 Hall of Fame Museum in 2006. He was one of the first members of the Lexington Jaycees and a past president of a businessmen’s organization in Lexington. He was a hard worker for the Taste of Country Fair for many years and helped every year with the kiddie rides. He enjoyed helping anyone in need of something fixed—his shop was always open. He enjoyed visiting with family and friends, playing pool, spending winters in Mesa, Arizona with Edna, and taking the little ones for rides in his little Model T car. He was a member of Lexington Community Church in Lexington. He loved the Lord and had a wonderful servant heart. His smile will be greatly missed by all who loved him. "Email Address" would like to share the life celebration of Willie L. Anderson. Click on the "link" to go to share a favorite memory or leave a condolence message for the family.